How Much Sequencing is Needed For ChIP-Seq ? One of the most common sequencing applications searched for and ordered on Genohub is ChIP-Seq. A frequent question we’re asked is how much sequencing do I need for my ChIP-Seq experiment? Your background (human) is : 3 Gb / 300 bp, or 1×107 fragments. So you need 1×107 + 3×104 ~= 1×107 sample hits for a 10x signal, with 10 fold enrichment. Here are some services on Genohub that would meet these ChIP-Seq metrics: https://genohub.com/shop-by-next-gen-sequencing-technology/#query=cac50ae846ca1cf773a39716b66f7142. The relationship between ChIP signal strength and regulatory activity is an area of active research. 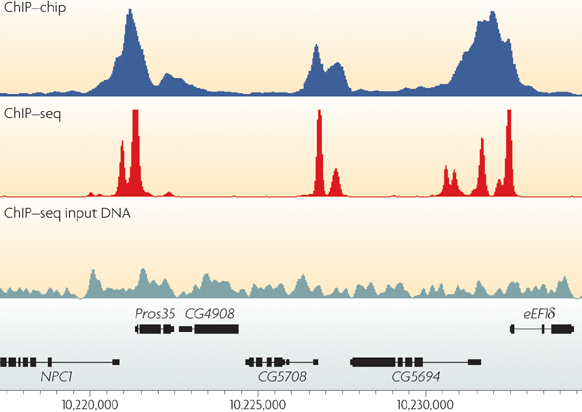 Some very active transcriptional enhancers often display moderate ChIP signal. As a result it can be difficult to set a threshold for Chip Signal strength that will be inclusive of all functional sites. A rough guide is ~ 20M unique mapped reads / mammalian sample. Designing a good control is essential for every ChIP-Seq experiment. A separate control should be run for every sample, cell type, condition or treatment. For a useful control, perform ChIP with an antibody that reacts with an unrelated antigen. Make sure you’re able to make a library that’s as complex as your experimental samples. We typically recommend that users dedicate at least the same if not more reads to their control versus actual samples. Making highly ‘complex’ libraries is important for ChIP-Seq. We’ve outlined several library prep kit options here: https://genohub.com/chip-seq-library-preparation/. Finally, if you’re new to ChIP-Seq and need more project advice, contact us for complimentary project consultation.